In a joint venture with the Australasian Shelley Collectors Club, The Shelley Group has compiled a new book on Shelley and Wileman Crested Miniatures. The book will be an invaluable reference for collectors of miniatures and will also be of interest to collectors of Gems, since many of the Gem patterns were applied to miniature shapes and had the same shape numbers. 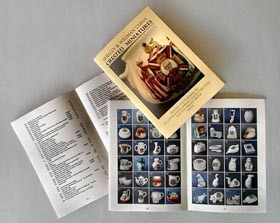 The book consists of thirty-two A5 sized pages, and includes six pages of text, a list of all known numbered and unnumbered crested miniatures and all known Parian busts, supplemented by a colour picture gallery illustrating nearly all of the miniatures, all of the Parian busts and a range of typical backstamps.